The dining room is a place to eat, hold conversations, and entertain guests. It’s a room that sees a lot of company and should be decorated accordingly. The following six contemporary dining rooms are extraordinary examples of what it means to dine in style. The beauty behind this room’s design is how simple and clean it is. There isn’t a lot of clutter to take away from the incredibly gorgeous furniture it contains. A pop of blue is all it takes to brighten up the room significantly. 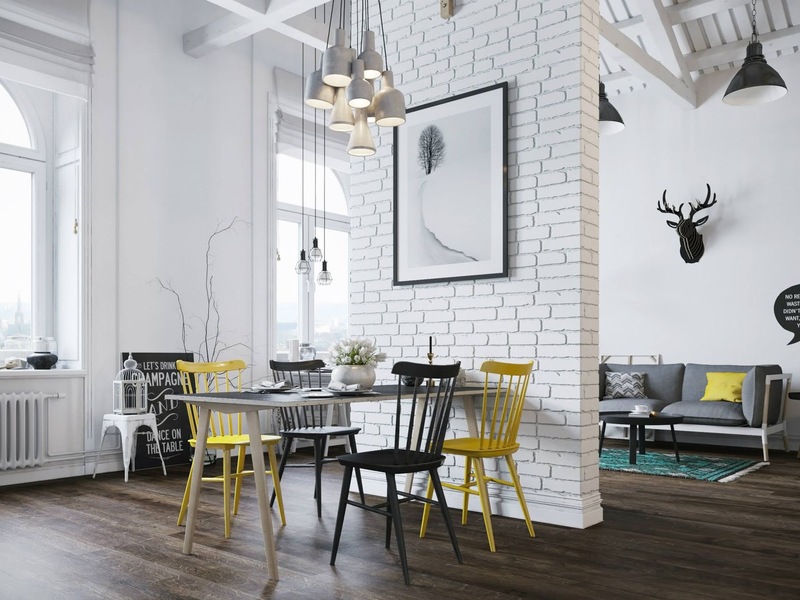 Sunshine-yellow-colored chairs makes this fabulous space sing. The furniture plays off the stone walls and mimics the natural light streaming in from the big picture windows. A playful yellow pillow can be seen in the living area of the home, making color transition seamlessly from space to space. Complement the wood floors in your dining room with a unique wood table. This one stands out because of all its imperfections. It’s a beautiful way to serve a meal and likely will become a big conversation starter because of how its cut. 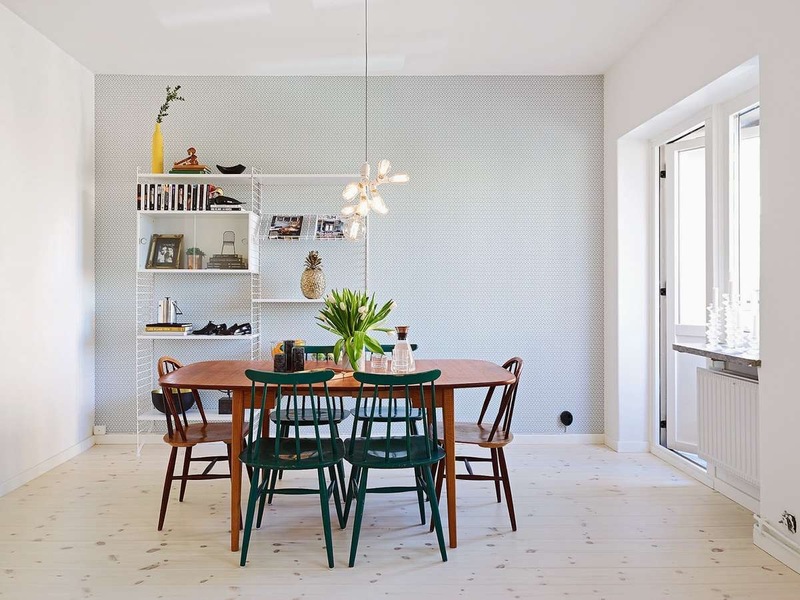 This dining room mixes and matches different materials for a look all its own. 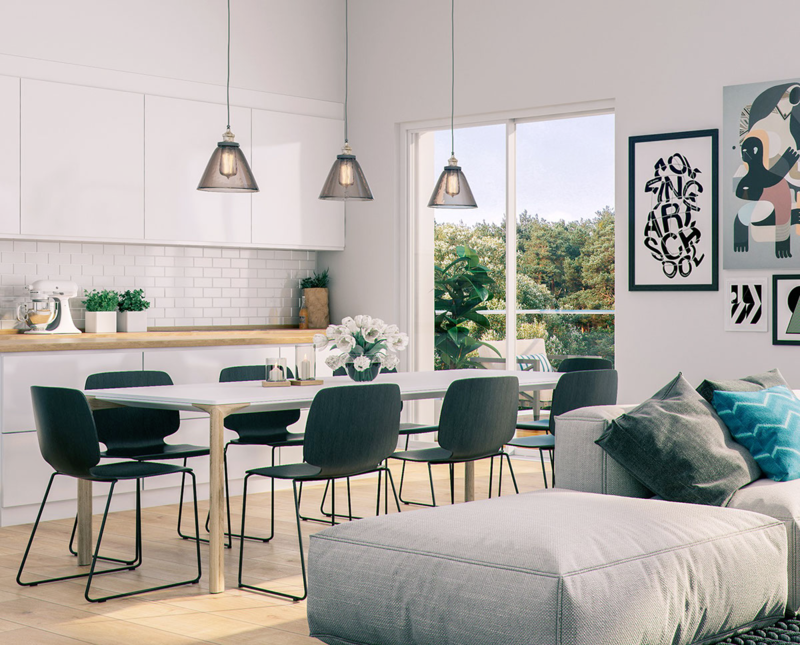 From its copper pendant lights to its industrial silver metal chairs, it’s a room you want to sit in and stay for a while. 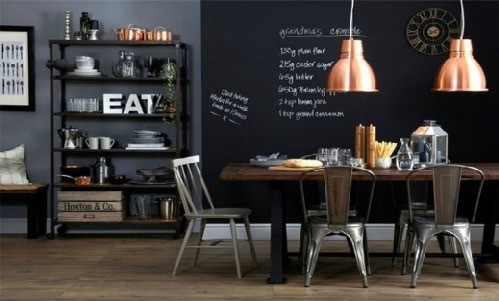 It’s charming and contemporary, the way you want your dining room to be. A bright shade of blue helps offset the starkness of the white chairs in this dining room. It helps cool down the dark finish of the table and plays off the natural light streaming in through the windows. You see a union of wood, glass, and metal coming together to create a beautiful contemporary space. 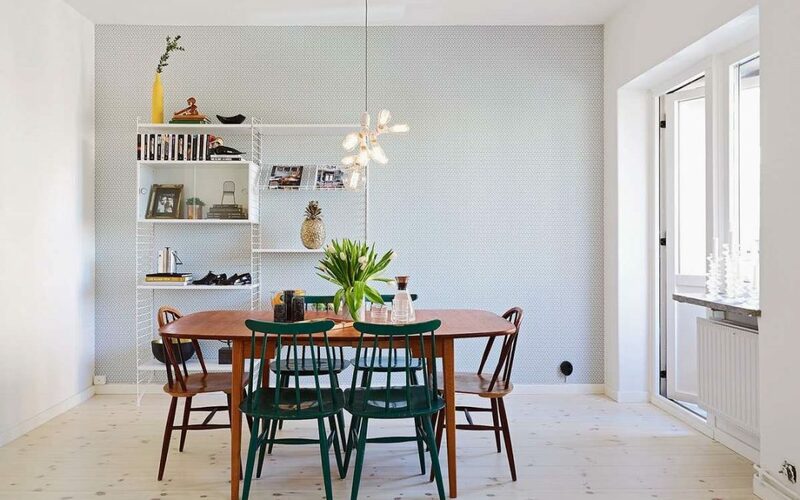 The introduction of three pendant lights to this dining space helps balance out seating. With three chairs on each side and one chair at both the head and the foot of the table, you can see how well this composition works for the space. Because there isn’t walls defining one room from another, virtual boundaries such as the lighting help the flow of each space as it transitions into the next. 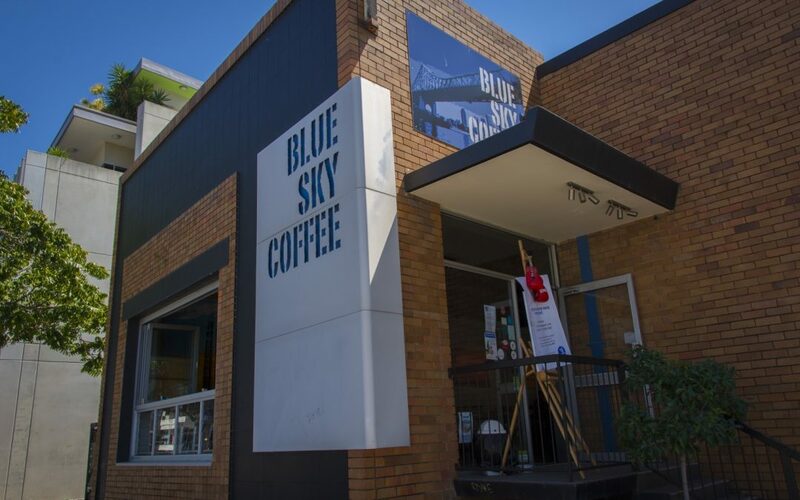 As the broad Brisbane sky changes from time to time, so too Blue Sky Coffee has morphed and changed appearance since its beginnings in 2009. 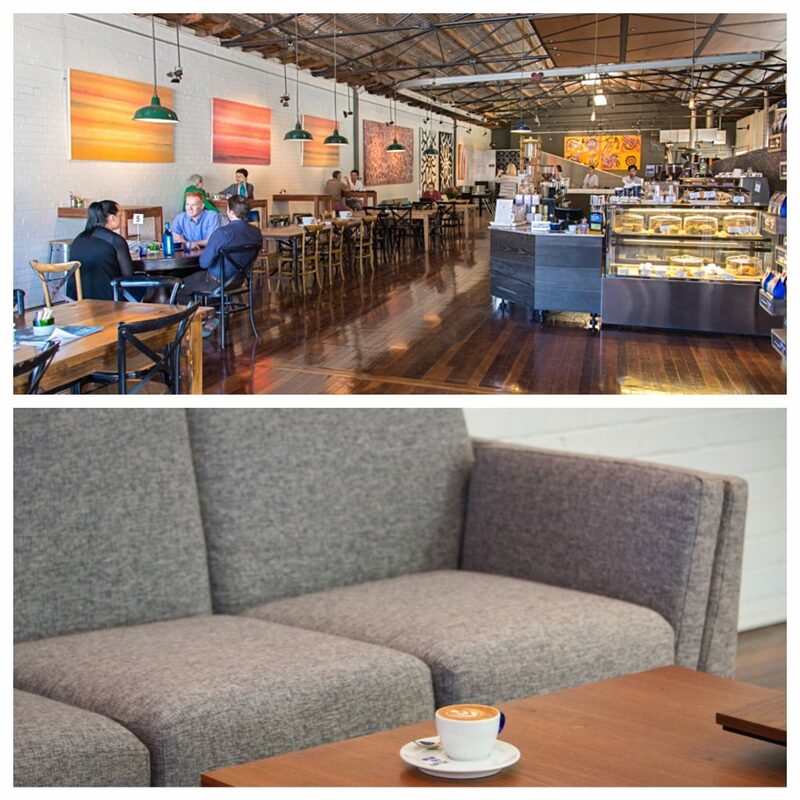 One thing that’s never changed is the chillaxing vibe of one of Newstead’s favourites … Oh … and the tasty coffees! 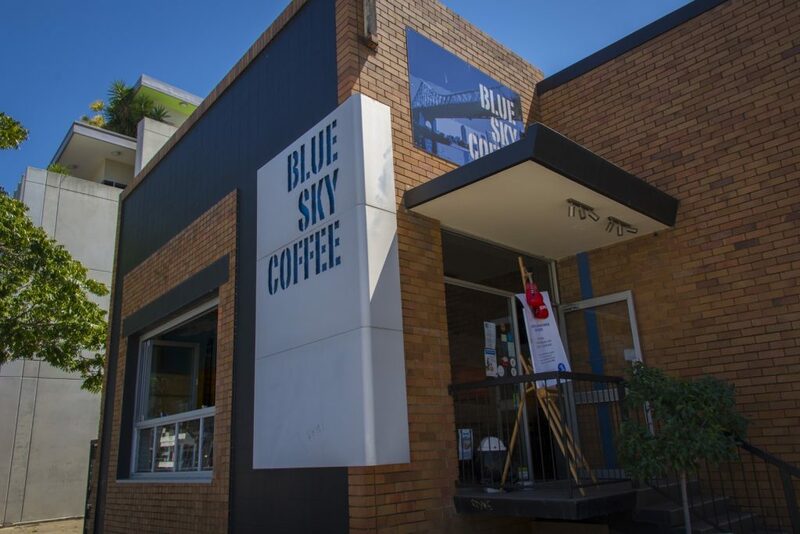 Blue Sky was conceived out of a passion for coffee, and led to the birth of one of Brisbane’s early cafes with coffee roaster on site. In a sense, you still feel this passion. 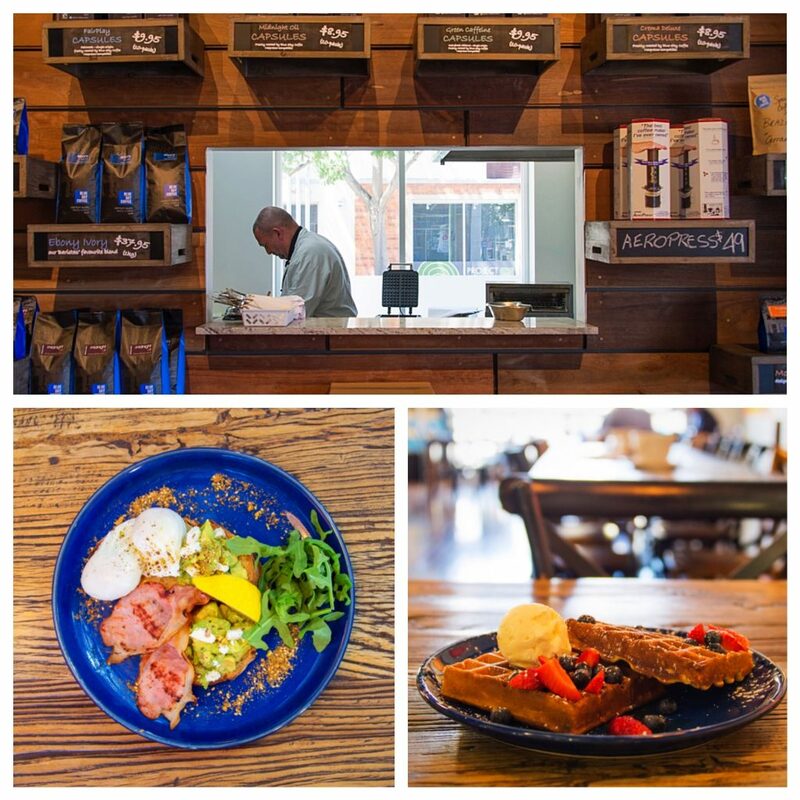 Just as blue sky smiled on the very first shipment of green beans, so too do the faces of the people that serve you. 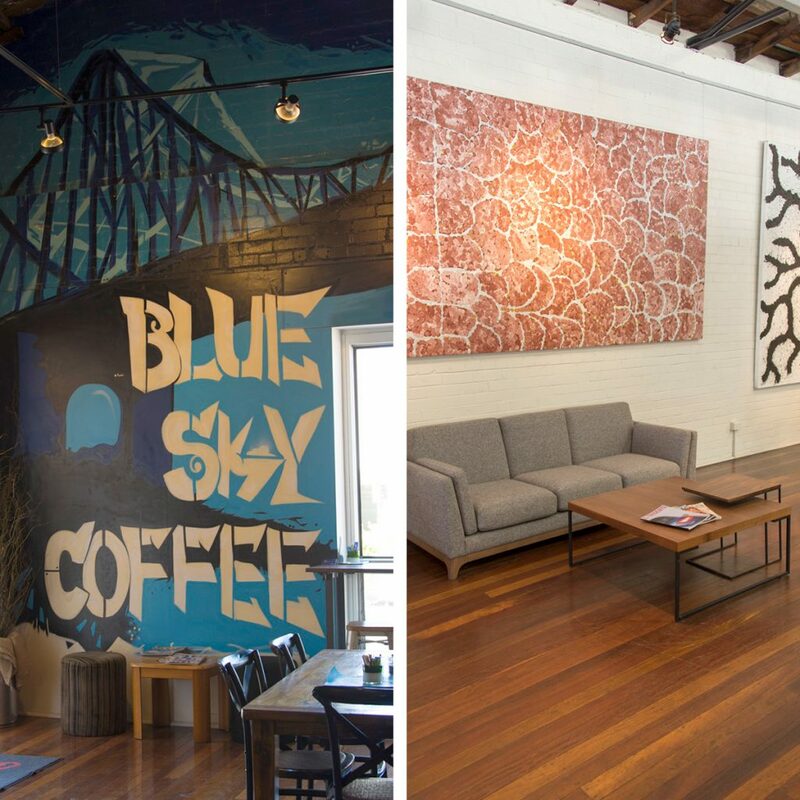 The stand out feature of Blue Sky Coffee has always been the space, both in look and feel. Manuela, Business Manager, described it beautifully as, ‘funky inner-city warehouse with a lay-back vibe.’ So true … this is definitely a place to chill and stay a while. I noticed lots of people tapping into the wifi and tapping away on their laptops whilst enjoying the sights, sounds, smells and tastes. Apart from the epic mural on the wall, featuring the Story Bridge, stunning art pieces from Fireworks Art Gallery also provide a great optical experience. If you like what you see, you can contact the gallery directly or take a short walk around the corner after your visit to see what other pieces are available. Another standout feature is the influence of girl power. 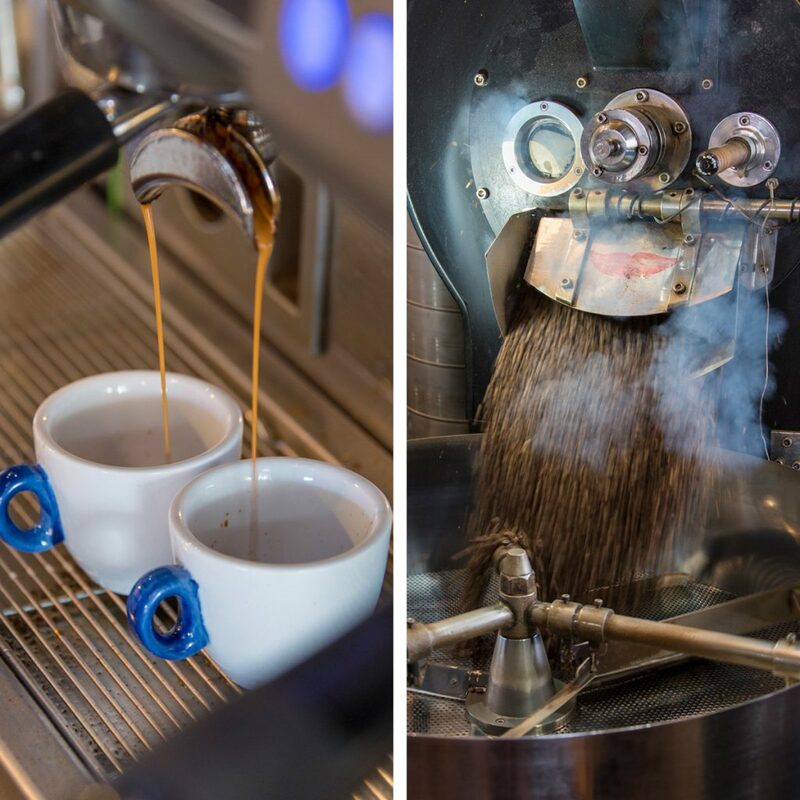 Blue Sky has one of Brisbane’s few female coffee roasters who lovingly watches over the Has Garanti roaster as it rolls the specialty beans around and around til they are ready to drop. The smell of roasting coffee made me want to dive into a tasty brew. The Ebony Ivory blend has distinctive chocolatey tones that work well with milk and is a real crowd-pleaser with the customers. The cappuccino certainly highlighted the chocolate notes of the easy drinking blend. Blue Sky also have rotating single origins. 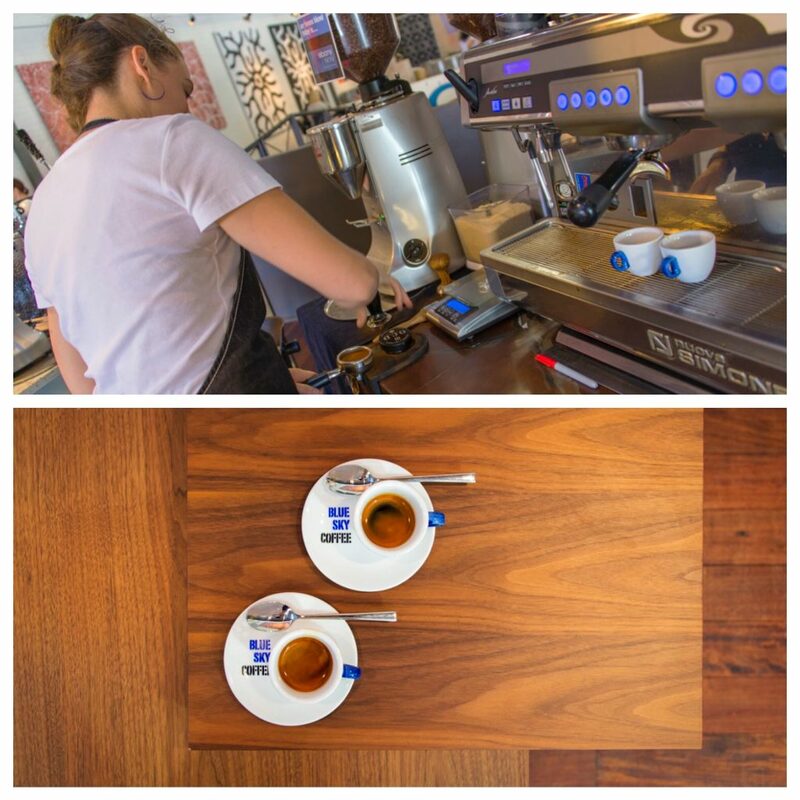 A delightfully aromatic Brazilian Cerrado was featured during my visit. But the pure delight was the cold drip. The Ethiopian Yirgacheffe felt like a soft satin sheet had wrapped around my tongue … although milk and lemon come along for the ride it was too easy to enjoy on its own. One of the first cold drips in Brisbane and still one of the best! If you’re a tea drinker, don’t fret. 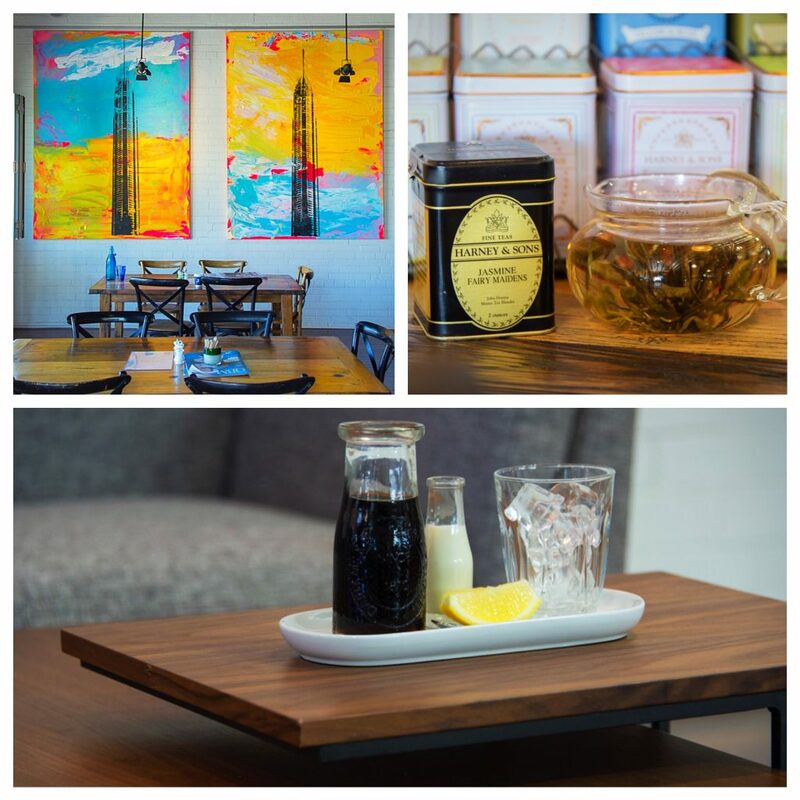 Blue Sky understand that tea drinkers are important too and offer a wide array of Harney & Sons fine teas. There is plenty of food on offer too. Chef Lee Booker described menu offerings as, ‘good wholesome food that is fresh, high quality and great value for money.’ With over 40 years experience in some of Brisbane’s iconic restaurants such as Baguette and Oxley Wharf, Lee prides himself on presentation and efficient service. Lee told me you will soon be able to enjoy your coffee with divine French pastries, like a chocolate croissant, that have been beautifully created by Jean-Paul of French Tart. You can even take home a baguette for dinner. All bakery and patisserie products are delivered to Blue Sky fresh every day for your eating pleasure. 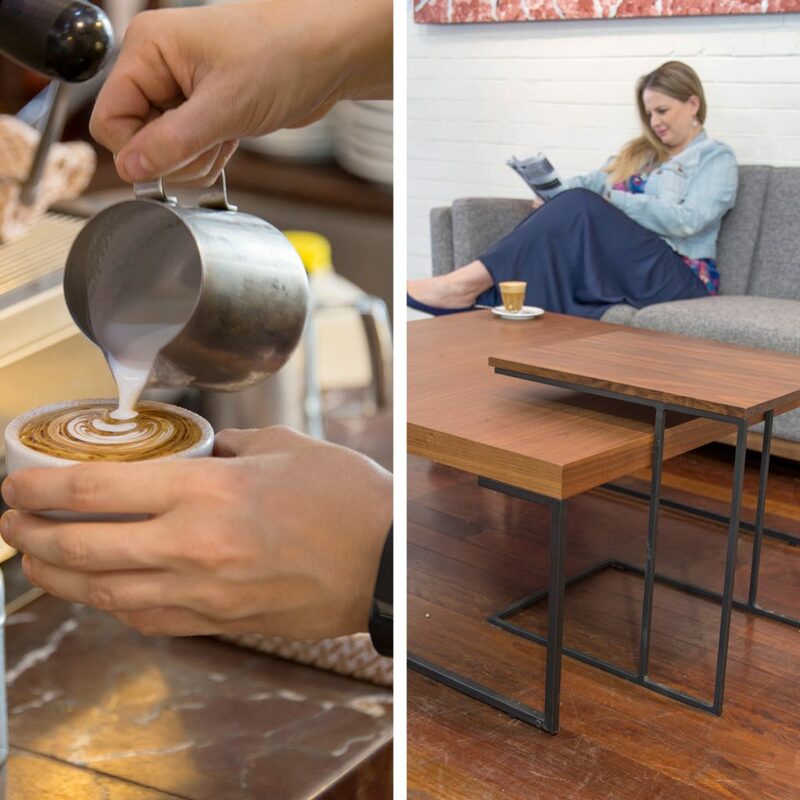 If you enjoy a relaxed, cafe-style atmosphere with fresh roasted coffee, then head to 32 Commercial Rd Newstead and join locals, gym goers and business people alike who frequent Blue Sky. 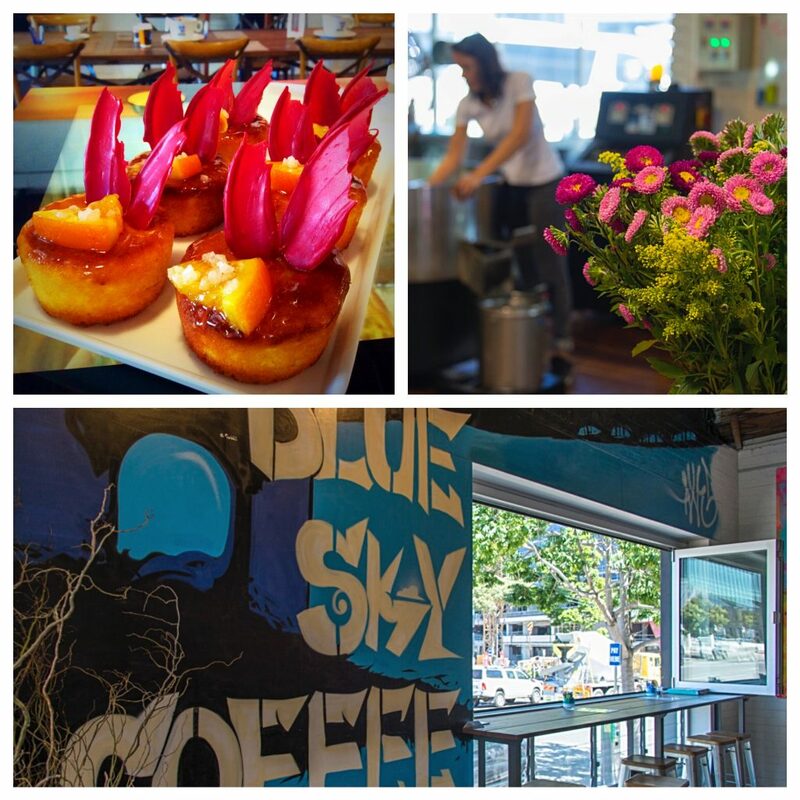 Whether the sky is blue or grey, Blue Sky Coffee is a great place to spend the day!